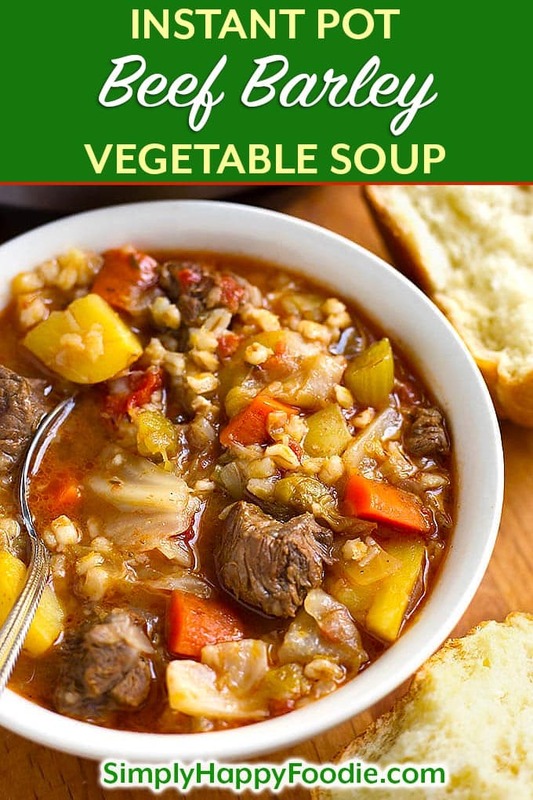 Instant Pot Beef Barley Vegetable Soup is absolutely a comfort food, one-pot meal. 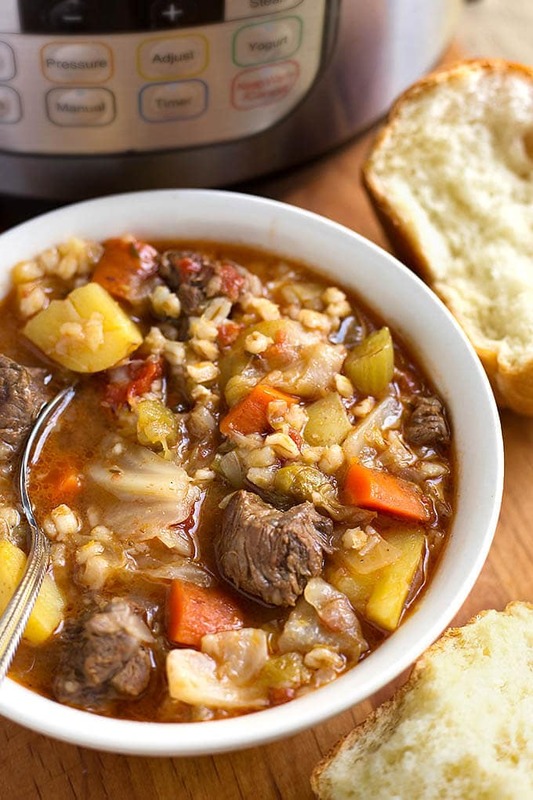 This pressure cooker beef barley vegetable soup recipe is dedicated to my dear Nana, and to all of the Nanas out there. This is a fun recipe for me, and I’m proud to be sharing it with you! My Nana was my favorite cook. She was just amazing, and she could do anything! I miss watching and helping her in the kitchen. When I found several of her recipes I was so happy! I could try to recreate the food that she cooked for the family! Nana had an old stove top pressure cooker that she used often. It always scared me a little, to be honest. All that hissing and steaming! But my how the times have changed! We now have electric pressure cookers, like the Instant Pot®, and they are so much safer than the old ones. 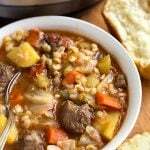 This Instant Pot Beef Barley Vegetable Soup is my Nana’s recipe. She made it when I was a child, and I always loved it. I recently ran across the recipe and thought since it is Fall, and definitely soup season, I’d give it a go in my IP. I have enhanced the recipe a little as I just couldn’t leave well enough alone! Always the rebel! I think Nana would be okay with that. This is a very hearty soup, it feels warm and good in your belly! It is really a one-pot meal. All you need is some bread or biscuits, and you’re good to go! If you are gluten-free, leave out the barley. I’m a Nana myself now (a young one, haha), and when I get a chance to cook with my grandkids, it fills my heart with nostalgia and lots of love. I hope you have the chance to cook with your loved ones and make those memories that last a lifetime. I have been getting amazing feedback from so many people who have made Instant Pot Beef Barley Vegetable Soup and loved it! Several people have made this with venison or elk and said it’s excellent! An old recipe of my Nana's that I have adapted for the electric pressure cooker (or stove top). 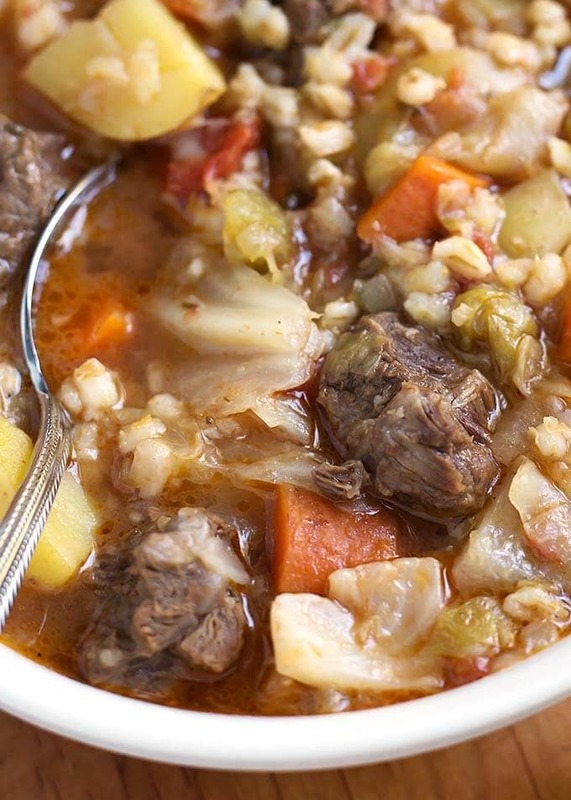 Full of hearty vegetables, beef, and barley. A one-pot meal! Set the Instant Pot to the Sauté (or browning) mode. When the pot is hot, add the oil. Add the beef chunks and spread out in one layer on bottom of pot. Let cook for a couple of minutes to develop a crust. Turn the beef over and brown on other side. Add the onion, carrots, and celery. Stir and scrape up any brown bits on the bottom of the pot. Add the garlic, stir and cook for just a minute. Add the tomatoes with juice, potatoes, cabbage, bay leaves, thyme, salt, pepper, barley, and broth. Stir. When cooking cycle ends, let the pot naturally release pressure for 15 minutes. Then open the lid when the pin in the lid drops. Stir the soup. Discard bay leaves. If you are Gluten-Free, leave out the barley. Would love to know the calorie count and how many it serves. Looks delish! Claudette, it’s 10 1-cup servings at 280 calories each (using chicken broth, fat free). Recipe is updated. I’m not a big fan of tomatoes in soup so how much additional broth do you think I should add to make up for the juice from the can of tomatoes? I would say 2/3 cup. This would also be good with some fresh or frozen corn added, maybe 1/2 to 1 cup. You can also increase the cabbage by 1/2 to 1 cup. Along with the 2/3 cup of extra broth. Great recipe! I followed the recipe exactly using chicken broth. My family loved it. Hi Kristy! I’m so happy that you and your family liked it! Nana would have been happy, too! I appreciate your feedback! Made the soup this afternoon and it is delicious!! This soup was absolutely delicious. A+ texture, flavor. My family loved it. I used a pound of bone in short ribs for the meat. This is a keeper. Thanks! Hi Margaret! That’s awesome to hear! I’m glad your family liked it. I love short ribs, too! Yum! This is the first dish I made in my Instapot. It came out delicious and the meat was so tender. I used one sweet potato rather than white potatoes. Thanks for sharing! Hi Maria! Thank you for your nice review! Sweet potatoes are so good in soup! can i use red cabbage?? Hi Maria, I think you can. I haven’t tried it, but how bad can it be? Red cabbage is delicious! Let me know how it turns out! I made this today to have while watching the Academy Awards. I loved the soup. It got a little too done though.should I reduce the time since I used a larger IP? Also I used Better than Boullioun Beef flavored. (3tsp) I think I needed a little more. Thanks for converting your Nana’s recipe for the IP! I will make it again! Hi Jan, I totally forgot to watch the Academy Awards! :O I would reduce the time a little the next time you make this, or cut the meat and veggies larger. If it was the barley that was too done, then yes, just reduce the cook time by 5 minutes or so. Thank you for the feedback! Is there anything I could substitute for the pearled barley? Hi Michael. You can leave it out, and serve with mashed potatoes. I was going to say rice, but it would be mush. Maybe serve over rice? Found the pearled barley. The soup is amazing. Making it for the fourth time, thank you! That’s awesome, Michael! How I wish I could tell my Nana, she would be so happy! Thank you for your review, I’m so glad you like this soup! My first instant pot recipe – thanks for the detailed instructions. This turned out great!! I think so, though I haven’t tried it yet. Made this with oxtails…adds richness! Roast the oxtails in a 450 degree oven, first (gets rid of a lot of fat) for about 10 minutes. I take the tender meat off the bones when done, since my husband cringes at the thought of “oxtails”. However, the meat is a winner! Yum! Oxtails are $8 per pound here, so we don’t have them very often. This does sound really good though! I need to invest in some oxtails! This is my first meal in an Instant Pot (I’ve done beans, rice, etc. as a test). This recipe is spot on! Reminds me of the soup my grandmothers would make when I was a kid. Hi Patrick! I am so happy that my Nana’s recipe brought you some good memories of your own Grandma! Thank you very much for your review, it means a lot to me! Hi, I just wanted to let you know this is the first recipe I tried after purchasing an instant pot, and it was fantastic. I followed the instructions exactly, except for adding a cup of chopped mushrooms, and it turned out perfect. My entire family loved it. Thank you for sharing such a wonderful recipe with very clear instructions. Awwww, that is so great to know, Kevin! I wasn’t sure if anyone would like Nana’s recipe as much as I do, but decided to put it out there anyway. I’m so happy that you liked it! Thank you for your nice review, too! I made the soup according to your recipe. It tastes so good! My Husband love it! I made this tonight. I used Better Than beef bouillon. Also, I didn’t have any celery on hand, so I just threw in extra cabbage and used celery seeds. I used a little bit of extra everything and filled it up to the water line. Delicious! I’m so glad you mentioned adjusting to 20 minutes or I might have left it on the standard 35. I didn’t know there was a quick adjustment other than “manual” for 20 minutes on the Stew feature, so THANK YOU. Sometimes I’ve definitely overcooked things and wondered why it came out that way when clearly the IP one-button programming steered me toward 35 minutes. It was also perfect because my husband walked in the door exactly when this dish was ready to be served. Hi Nicole, I’m glad my instructions helped you. Thanks for your review! This was SO GOOD! I used beef “Better Than Bouillon” and added in some chopped kale from my garden. I used fresh chopped tomatoes also. My kids (1 and 3) loved it. It did take quite awhile to saute the beef and veggies then pressure cook so it wasn’t a super quick meal but it did make lots of leftovers. That’s great, Sarah! Thank you for letting me know! Hi Sandy. I like a more “liquidy” soup with more broth, and the recipe looked a bit “dry” for my taste. So I used 3 cans of stewed tomatoes (for extra flavor) which I put in a big bowl, and crosscut them with a couple of knives into large chunks, and added an extra cup of beef broth. Also used one packet of dry vegetable soup mix, and instead of just cabbage found an 8 oz bag of chopped red cabbage, kale, and broccoli at the store. Oh, plus a tablespoon of fish sauce. Because of the extras, I let it go for 25 minutes as well. Wow! Really tasty, thank you! When I make it again, I think I’m going to add even another cup of broth…gotta have something to dip that bread into! Hi Mark, I like that you could adjust this recipe to your liking! Thank you for your review! I just bought the instant pot mini and sorry if this is a dumb question. But would these amounts work I. The mini. Hi Robyn, I would cut the recipe in half, or reduce it by 1/3. Made this for dinner tonight. It was so wonderful. I will for sure make this again. Hi Amy, I’m so glad you liked it! Thanks for the review. I made this awhile back and everyone loved it! Wondering if you think I could do it in the slow cooker. We are going to be away for the day tomorrow, so I thought it might be nice to throw in there for it to be ready for when we get back. Any tips on that? Or just throw it all in and see what happens? Brown the meat first? Thanks! Hi Jessie, I would brown the meat first, toss it all in and see what happens. I think it will still be great! Is this recipe made in a 6 quart Instant Pot? Yes, a 6 qt or 8 qt will work. Do you know if it’s possible to double or make 1.5x this recipe in a 6 quart? I have to make soup for a teacher potluck at school, and I want to be able to serve the maximum number servings I can make. This recipe sounds amazing… Thanks! Hi Julie! I think 1.5x would be safest. Do a longer natural release as the pot will be fuller (more full?). I am so excited that I stumbled across your recipe one day after a couple Instant Pot fails. I was about to give up on my Instant Pot, but decided to give it one last shot with your recipe. The soup turned out amazing and has become an often requested favorite for my family and friends. Thank you so much for sharing your Nana’s recipe! Hi Kadie! I’m so happy that you found me! Thank you for your nice review! Hi Kadie, I have been using my Multi Cooker for about 7 years now, and I was in a rut! I was not using it for all the things it can do. That’s why I’m happy that I found you! I love your comfort food recipes. Right now I’m waiting for my split pea soup to get finished! It smells great! Do you think the cooking time would be the same if you left out the meat? The cook time would be much shorter as the meat needs a long cook time to become tender. Try 10 minutes with a 10 to 15 minute NPR. I just made used my Instant Pot for the 1st time and tried your recipe, it is so good. Hi Patricia, thank you! I’m so glad you liked this recipe! I HAVE A 3QT MINI INSTANTPOT, YOU SAID TO REDUCE BY 1/2 OR 1/3 WOULD COOKING TIME BE THE SAME? Would there be enough liquid to build pressure? Hi Meredith, yes, there will be enough liquid. If you cut the recipe in half, there will be 1 1/2 cups of liquid, which is plenty. I like my soup a little more soupy, so would use 2 cups. The cook time will remain the same (to cook the meat until tender). Made this, my husband didn’t like potato in soup so I left that out, it turned out great still! I love how we can get so much vegetables into this 🙂 he wants the soup to be thicker next time (though maybe it would have happened with the potato), so I might try to add cornstarch next time. Thanks for the recipe! I love this recipe! So delicious! Could it be frozen after you make it? Loved the flavor of this soup, the meat was perfectly cooked. I found everything else was overcooked and mushy. If I cut the veggies thicker and cook 5 minutes less will that work? Obviously I’m not an experienced cook, but always trying to be better. Hi Tony, yes, you do need to cut the veggies slightly larger. You can try 5 minutes less time as well to get the texture you like! Thank you for letting me know! Sandy, I am wondering if I can leave out the cabbage? I have everything else. Also, I have 1.7 lbs stew meat and 1.5 lbs potatoes. Could I make up for the cabbage with extra potatoes, or meat? Or if I did all of each would I increase the broth? Yes, you can leave out the cabbage and add extra meat/veggies. You will want to keep the cook time the same. I made this tonight for the first time, followed the recipe just minus the tomatoes because I’m not a fan and I have to say it was delicious! We loved it! Will be making this again. Thank You! That’s great, Donna! Thank you! If I used left over pot roast what would I change the cooking time to? I would cut the cook time down to about 8 minutes. This was absolutely delicious and I made the recipe exactly as stated. The meat was tender, the veggies held their structure, the amount of barley was perfectly proportioned to the rest of the ingredients, and the soup had lots and lots of flavor. This one is definitely a keeper. Thank you, Linda! Nana would be so happy to know you liked her recipe! Another Instant Pot favourite for the books! Thank you for sharing, it turned out wonderfully! Even my small children love it! Thank you, Gen! I’m so glad! OMG I Decided to take your recipe and make it VEGETARIAN and Nana WOULD BE PROUD!! So for the Vegetarians out there. Instead of Chuck Roast I used one Package of Morningstar Farms “Steak Strips” and then used Vegetable Broth instead of the Chicken or Beef Broth. Partly defrosted the “Steak Strips” so I could then cut them into cubes. This soup is AMAZING. I could not have picked a better recipe. THANK YOU Simply Happy Foodie for sharing this. I am trying to rate it 5 Starts but it won’t let me rate it at all. Thank you, Werra! I’m so happy to know how well this recipe worked for you! Just got my 8 quart Instant Pot and am going to try this recipe. Can I cook the barley in a separate pot? I find when I cooked it in other soup recipes the barley thickened the soup broth too much. Sure, just add it in after pressure cooking. Wanted to let you know that the recipe is pretty forgiving. I NEVER ask Hubby to help but he wandered through the kitchen while I was making this. I thought just two fresh tomatoes was not enough and asked him to please grab me a can of diced tomatoes. He popped open the can and I dumped them in. I could tell immediately he had grabbed the wrong can and indeed I had a can of Fire Roasted Tomatoes juice and all in the soup. Rather the freak out I embraced the mistake. You know what it gave the soup just a tiny kick and I think we will do it again. At any rate this soup is a huge Home Run. Again we made it with Plant Based Steak Strips and Vegetable broth so that its vegetarian for me. Meat eating husband still loves it. Nothing like a happy accident! Hi, I can’t wait to try this recipe. I am wondering if the barley is cooked with the soup recipe,will it take a lot of the broth from the broth and make it too dry? It will be nice and soupy. Some people have added a little extra barely. I would make it per my recipe and see how you like it first.